South Korea's Moon: Kim Jong Un Still Committed To Denuclearization : Parallels The U.S. and North Korea are moving ahead with plans for a potential summit between President Trump and Kim Jong Un. It comes as South Korea's president held a surprise second summit with Kim. South Korea's President Moon Jae-in speaks during a news conference at the presidential Blue House in Seoul on Sunday. He met with Kim Jong Un on Saturday. "What's uncertain for him is not his intentions for denuclearization, but Washington's stance in hostile relations with North Korea, and whether Washington can really secure and guarantee his regime," Moon said, in a rare Sunday morning press conference. 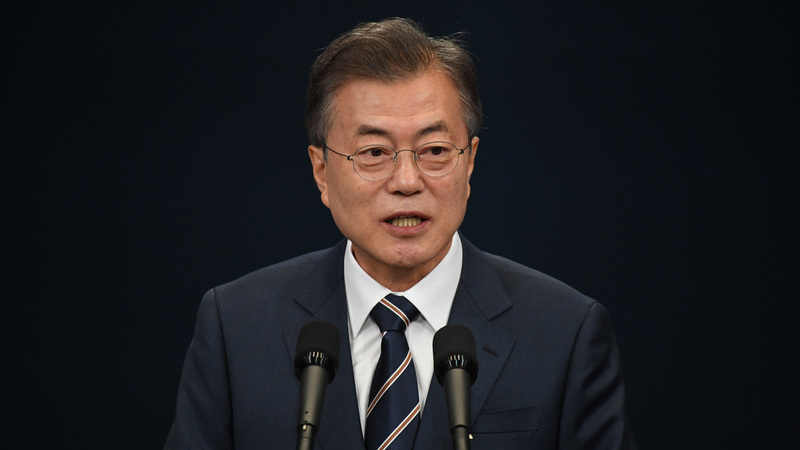 Elected on his strong pro-engagement positions, Moon said he pressed with Kim that North Korea and the U.S. need to keep direct communication channels open, in order to "eradicate chances for misunderstanding." On Thursday, citing North Korean "hostility," Trump abruptly called off a summit he had scheduled with Kim. By the weekend, however, Trump seemed to signal things could be back on. "We're looking at June 12 in Singapore, that hasn't changed," Trump said. The off-again, on-again diplomacy is making Korea watchers dizzy. "It's really gotten to the point where if you walk away from your computer or your Twitter feed for more than 10 minutes you find yourself hopelessly out of date," says the Heritage Foundation's Bruce Klingner, who's a former CIA analyst on the Koreas. When Moon was asked whether Kim supported the U.S. definition of denuclearization — which is an irreversible, verifiable giving-up of nuclear arms — Moon said that's up to Washington and Pyongyang to work out. "The two sides are still very wide apart on what they feel denuclearization is," Klingner said. Whether they can bridge that gap in the coming weeks may decide whether Trump and Kim will meet face-to-face. Both Korean leaders say they're invested in making that summit happen. NPR News Assistant Se Eun Gong contributed to this post.